to the first newsletter from the 20 Miles More campaign group. You are receiving this email because you have previously expressed an interest in the growth of the city of Liverpool, and we believe that linking the city to the proposed HS2 network will be a vital component in this growth. We’d like to invite you to attend our campaign breakfast on the 20th March at Oh Me Oh My in the West Africa Building on Water Street at 8am. This is an important opportunity to find out more and get on board with the 20 Miles More campaign. We are keen to hear your views and answer questions about how we can deliver a united and independent campaign to get a direct HS2 link to Liverpool as an integral part of the project. You can read our “What’s Next?” article below for more details. The newsletter covers why the campaign is needed, our successful launch, endorsement of our thinking from the Institution of Civil Engineers, as well as some ideas about how you could show your support for the aims of 20 Miles More. Our journey has begun! You might have noticed. Our campaign launch has attracted a fantastic amount of media attention as well as quite a bit of social media buzz! The key launch message was the massive economic cost to the City Region – estimated to be over £2 billion – if we don’t get an HS2 connection and the potential £8 billion benefit over 20 years that could be achieved for the sake of only 20 Miles More track. The response was fantastic – we had extensive coverage across all local and regional media including the Echo, Bay TV and Radio Merseyside covering the story. In addition, BBC North West Tonight interviewed Andrew, Phillip and Merseyside businessman Tony Caldeira who explained how the absence of an HS2 link would inevitably make the city a less competitive and desirable business location. To top it all off, Andrew was interviewed on the Today Programme on Radio 4, and the open letter was given a prominent column in the Financial Times, Britain’s most prestigious financial opinion maker, read across the world. The story reached a number of online news providers, most notably the Telegraph, which kicked off a number of discussions on Twitter all of which can be followed on our timeline @20MilesMore. For the first time ever the case for a direct HS2 link was delivered clearly and unequivocally reaching the ears of people across and beyond the City Region. Discussions have reached as far as Chester and Warrington, and even Manchester has offered signs of support, such is the strength of the case for a direct HS2 link to Liverpool and its potential to benefit the whole of the North West. 20 Miles More has put Liverpool firmly on the HS2 map! In their official response to the HS2 phase two consultation, the ICE have, in their first point of advice, recommended the government should: “Further examine the case for providing the Liverpool city-region with a dedicated HS2 branch and service”. 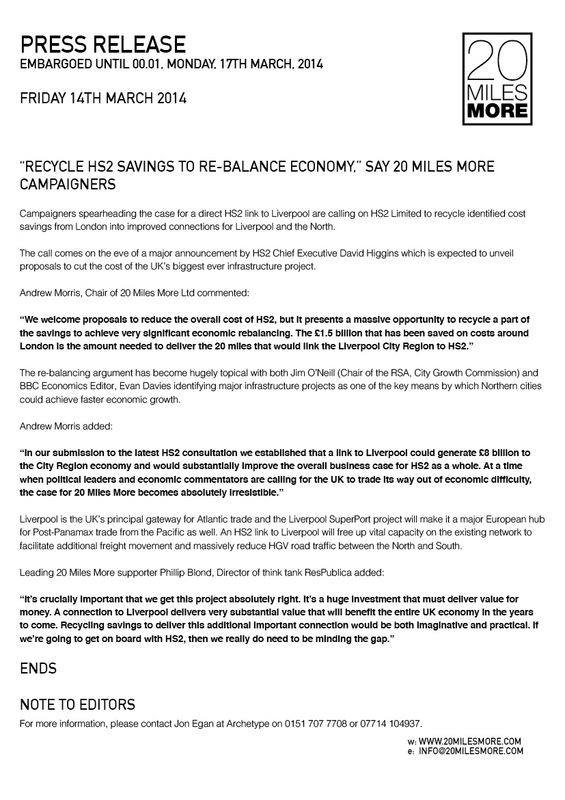 The response, which was released on the morning of the 30th January, provided another strong endorsement to the 20 Miles More campaign and shows that there is a growing consensus that an HS2 link to Liverpool makes national as well as local economic sense. Their response also supported our plea to examine the outcome of the current proposals for the freight network. 20 Miles More has shown that the current HS2 plan doesn’t add freight capacity on the North West rail network and will crucially constrain rail freight expansion and damage the prospects for the growth of the Port of Liverpool. The ICE response recommended Government “engages in further dialogue with stakeholders to examine how regional, local and freight services may be best enhanced on the existing railway once HS2 comes into operation”, which we believe would make clear the negative effect that HS2, as it is proposed, would have on the Liverpool region and Superport. Following our successful launch we have been busy taking the 20 Miles More message to key organisations and influential leaders in Liverpool and in London. We have had constructive meetings with the Liverpool Local Enterprise Partnership who have reiterated their belief that Liverpool needs a direct HS2 link. We have also had a positive meeting with Merseytravel and are looking forward in the coming weeks to meetings with Professional Liverpool, a follow-up meeting with the North West Business Leadership Team and our local MP’s. It’s absolutely vital that we maintain momentum and continue to mount a robust business-led campaign for an HS2 link to Liverpool. For this reason we are inviting you to attend our campaign breakfast on the 20th March at Oh Me Oh My in the West Africa Building on Water Street at 8am. This is an important opportunity to find out more and get on board with the 20 Miles More campaign. Speakers will include Andrew Morris, Phillip Blond and a representative from ICE. We are keen to hear your views and answer questions about how we can deliver a united and independent campaign to get a direct HS2 link to Liverpool as an integral part of the project. While this has been an excellent beginning to the fundraising appeal, there is still a way to go. 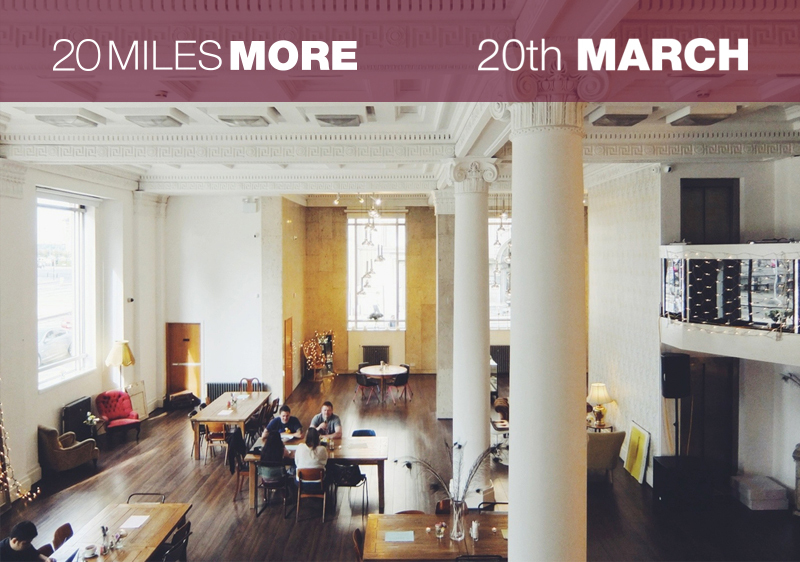 Visit www.20MilesMore.com to pledge your support and register for the breakfast on the 20th March to join together with other major business leaders to give this campaign the backing it needs. HS2 is hailed as a vital piece of national infrastructure designed to bring prosperity to the regions and help rebalance the UK’s economy. We are therefore deeply concerned that the current proposals do not include a direct link to Liverpool; the nation’s gateway to two of its greatest trading partners – Ireland and the United States. Liverpool is the largest city in the North and Midlands without a dedicated link or station on HS2. With the £1.8 billion SuperPort expansion, it will also be the UK’s only West coast port equipped to handle the new generation of Post-Panamax ocean carriers. Without a direct link to HS2 the potential of this investment will be jeopardized with rapidly increasing passenger and freight traffic having to share an already congested Victorian railway. Liverpool is vital to Britain’s status as a major trading nation. The city has, in recent years, experienced a remarkable renaissance and levels of economic growth second only to London. Just 20 Miles More rail route is needed to enable Liverpool to play its full part in supporting Britain’s economic renaissance – a small but crucial addition to the 330-mile HS2 network. This is why we are promoting a compelling business and economic case for an HS2 link to the Liverpool City Region. Studies demonstrate direct benefits of up to £2.70 for every £1 spent on this link compared to a return of only £1.80 for the project as a whole. 20 Miles More adds as little as £1.5 billion to the £42.6 billion cost of HS2, yet that additional investment could generate £8 billion over 20 years for the economy of Liverpool and the North West. In 1830 a group of Liverpool businessmen changed the world. They took the lead in backing the revolutionary Liverpool and Manchester railway. In so doing they brought cities and people closer together, transformed trade and altered the course of history. In 2030 we have the opportunity to deliver another visionary rail project. By backing the 20 Miles More campaign, we will secure the missing link that enables HS2 to fulfil its key economic aim of rebalancing the UK economy. 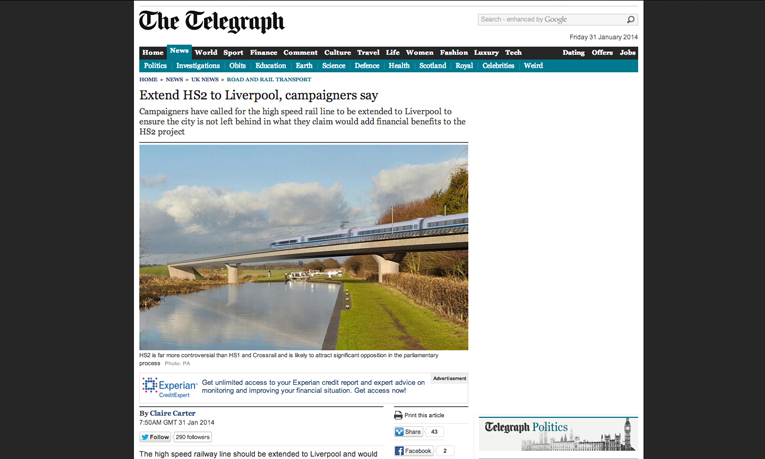 Today we urge the Government to support the linking of Liverpool to the HS2 network, with a pledge to go 20 Miles More.